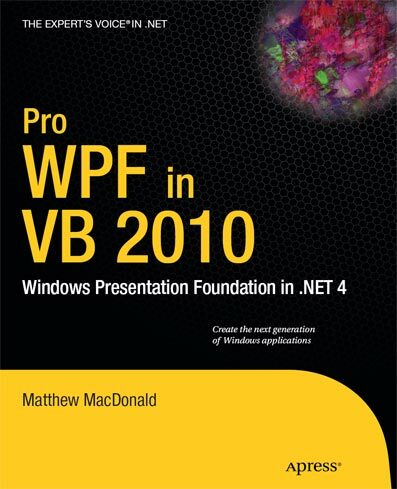 Pro WPF in VB 2010 /by Matthew MacDonald (Author) .Microsoft’s Windows Presentation Foundation (WPF) provides the foundation for building applications and high-quality user experiences for the Windows operating system.It blends the application user interface, documents, and media content, while exploiting the full power of your computer’s operating system. Its functionality extends to the support for Tablet PCs and other forms of input device, and provides a more modern imaging and printing pipeline, accessibility and UI automation infrastructure, data-driven UI and visualization, and integration points for weaving the application experience into the Windows shell. 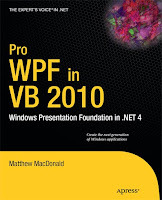 This book shows you how WPF really works. It provides you with the no-nonsense, practical advice that you need in order to build high-quality WPF applications quickly and easily. Having built a firm foundation, it goes on to explore more advanced aspects of WPF and how they relate to the others elements of the .NET 4.0 platform and associated technologies such as Silverlight.